State companies Statoil and Rosneft set up a joint venture for the development of the Severo-Komsomolskoye field in the far northern Yamal-Nenets region. «This document opens an important phase in the long-term cooperation between Rosneft and Statoil,» Russian oil company leader Igor Sechin says as the new cooperation agreement was struck this week. 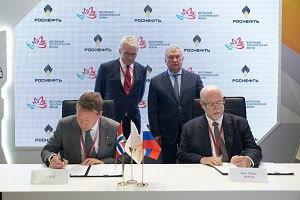 The deal, signed during the ongoing Eastern Economic Forum in Vladivostok, will give the Norwegian company a 33,3 percent stake in SevKomNeftegaz, the field operating company. Rosneft controls the remaing share. The two companies have over the past two years successfully drilled two wells in the Severo-Komsomolsky license area. According to Rosneft, the results show that oil and condensate resources are estimated to 111 million tons, more than double of the original estimates. It is Statoil which has financed the two exploration wells. The Severo-Komsomolskoye field is part of the comprehensive cooperation agreement signed by the two companies in 2012. It is located in the oil-rich b Purovsky and Nadymsky areas of the Yamal-Nenets Autonomous Okrug, a region located in the Arctic part of Ural Russia. The license covers a 1,368 square km area and the total resources are estimated to 203 million tons of oil and 179 billion cubic meters of gas. In addition to the Severo-Komsomolskoye, the 2012 cooperation agreement between the companies also includes the Magadan-1 and Lisyansky licenses in the Sea of Okhotsk and the Perseevsky licenses in the Barents Sea.